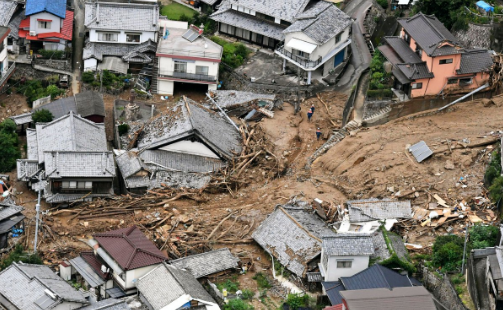 Three days of torrential heavy rains combined with mudslides and floods took a heavy beating on Japan as a combined 48 confirmed dead and 28 presumed dead means the loss of life keeps rising while some 50 others are still missing. The Japanese government, knowing that more rain is on the way, set up an emergency office as if it were dealing with a crisis like a major earthquake. Several military paddle boats were being used to take elderly people to dry land. Government officials ordered four and a half million people to evacuate at a certain point as rains continued to lash the land. 50,000 army staff, police and firefighters were called in to search for those trapped or wounded. Residents of Kyoto were at first hopeful that the weather forecast called for an easing of the rains by Sunday afternoon, but to their surprise this changed again later on. Many are hoping that the situation will not be as bad as in September 2013, when a flood caused by a typhoon forced thousands to evacuate the major city. According to the Japanese Meteorological Agency, certain affected areas have now received as much rain in the past five days as they normally get during the whole month of July.